A fair green – For the fainthearted . . .
Tor Fair never compared with Bridgwater Fair a week later, a much smaller, more modest affair, something forgotten until walking from the High Street in Glastonbury to one of the town’s car parks. In former times, before the advent of out of town shopping centres and new housing developments, the fair was held on land between Street and Glastonbury, now it is tucked in within walking distance of the town centre. Arriving at it before lunchtime, meant arriving when everything was closed, when the entire Fair was dormant, when the machinery rested like some great sleeping monster that would stir into life once evening fell. Funfairs seem smaller than they were in childhood days, the rides less daunting, the heights scaled not as great, the speeds slower, the spinning less nausea inducing, the turns less gut-wrenching. Even the dodgems seem to have less acceleration, their collisions less violent. Yet the passage of four decades has not lessened the intensity of the memories of such times. Our local fair was neither Tor Fair at Glastonbury nor the massive Saint Matthew’s Fair at Bridgwater; our local fair was in the little village of Long Sutton. 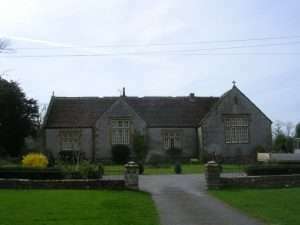 The village green adjoined the medieval parish church and was bounded by the Victorian primary school. It would have been filled to its capacity by dodgems, merry go round, swing boats and sideshows; yet however small the fair might have been, it was special to us. And strong tastes went with those special moments. Thickly coated toffee apples on wooden sticks, ginger snaps in paper bags, candy floss that left your face feeling sticky, bars of nougat that threatened to bind your teeth together. There would perhaps have been half a crown to spend at the fair, two shillings and sixpence, enough, perhaps for five rides, or fewer if one bought one of the confections that threatened young teeth. It can’t have taken long to spend the money, yet there are no memories of being unhappy, no memories of wishing there has been more to spend. Long Sutton fair meant seeing friends, it meant hearing shouts of fun and sharing in laughter, it meant watching machines that would not be seen in the village again until the following year. Perhaps Long Sutton fair was about being rather than doing, perhaps the joy was in being at the fair rather than in anything one did at the fair. Perhaps seeing joy and sharing in joy was as important as feeling it. I wonder is there a onionlike progression to a major center with the last fair just ahead of the rent quarter day.